We are already working on the Emplotime version 3.3 which apparently will include Projects and Exception Reports, however, in the meantime we have released a small version. The version 3.2 recently released is packed with some goodies related to employee working hours reports. This new feature is going to be very handy for those companies having employees working overnight. 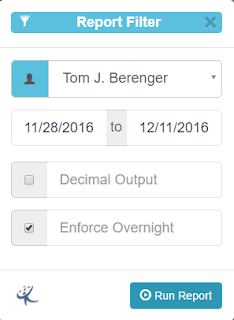 The filter reports now includes the possibility to check the "Enforce Overnight" checkbox. By selecting this checkbox, the output report will maintain the whole transaction within the same day. (Preventing of getting it separated in two different days). For example, if Tom clocked In on Wednesday at 10:00 PM, and clocked out at 05:00 AM in the following day, the entire transaction will be recorded for Wednesday.